In 1996, Life Magazine proclaimed Thomas Edison the “Man of the Millennium’ … not the decade or century, but the millennium-1,000 years! That is a very bold statement, not spoken lightly. 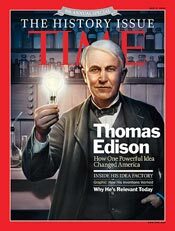 Recently, Time magazine has also lavishly spoken of the relevance and importance of Thomas Edison. His exploits and value to the American economy and society are legendary-the man who gave us motion pictures, phonograph, the light bulb and electric power industry, vastly improved telephones, and commercial R&D labs that Fortune 500 companies use to give birth to an endless march of new products. He is the man most associated with technology based progress. Many years after the creation of these products his accomplishments are still responsible for one-tenth of our gross national product today, as well as about one-fourth of all the jobs on the planet. This is a powerful message for peace through prosperity, linking technological progress and society’s well-being, something Edison felt viscerally. Development of low cost concrete houses to address housing shortages. 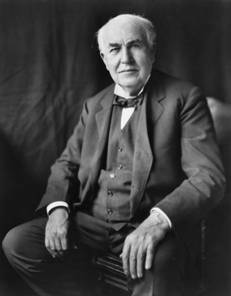 The Edison family gave freely and generously of themselves to the country. And after Thomas Edison’s death, his family gave his invention factory and their Glenmont home to the American people, to celebrate Dad’s work and as a classroom for future entrepreneurs. Humanitarian principles ran deep in the Edison family. This entry was posted in All About Tom and tagged Humanitarian on March 21, 2014 by Edison Innovation Foundation. very web savvy so I’m not 100% certain. Any tips or advice would be greatly appreciated.